Interested in joining the iSpace team? Interested in con­tribut­ing to inno­v­a­tive research at the inter­sec­tion of Psychology/Cognitive Science, Informatics, Human Factors/HCI, and Virtual Reality in an inter­dis­ci­pli­nary team? 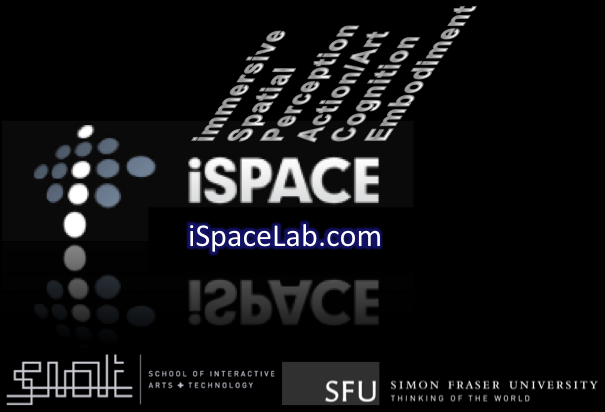 I’m always look­ing for bright and moti­vated PhD/MSc stu­dents and post­Docs to join the iSpace lab at the School of Interactive Arts & Technology (SIAT), Simon Fraser University in the greater Vancouver region in beau­ti­ful British Columbia, Canada. Applicants should be highly moti­vated and have a strong inter­est in inter­dis­ci­pli­nary sci­en­tific research aligned with the over­all goals and vision of the iSpace lab (see iSpaceLab.com/vision) and at least one of our recent Projects. Brain-computer inter­faces and biofeed­back (breath­ing, EEG…) for immer­sive, play­ful VR inter­ac­tion design to foster desire­able states (e.g., mind­ful­ness, relax­ation, overview effect, piv­otal experiences). Design and iter­a­tive eval­u­a­tion and improve­ment of per­cep­tu­ally ori­ented, multi-modal human-computer inter­faces and human-centered, effec­tive vir­tual real­ity sim­u­la­tions and expe­ri­ences. This could include uncon­ven­tional VR inter­faces, immer­sive VR for med­i­ta­tion, and other novel ideas. Investigate and uti­lize multi-modal and higher-level syn­er­gis­tic ben­e­fits to enhance self-motion illu­sions (vec­tion) in VR, which con­tributed to fun­da­men­tal knowl­edge and can help to enable more com­pelling and effec­tive human-computer inter­faces for immer­sive VR. Design & eval­u­ate user-powered motion cueing inter­faces to enable more nat­ural and intu­itive loco­mo­tion through and spa­tial ori­en­ta­tion in VR, for both ground-based nav­i­ga­tion and full 3D nav­i­ga­tion (both vir­tual flying and tele-presence/tele-operation appli­ca­tions like drones. Investigating the functional/behavioral sig­nif­i­cance of self-motion illu­sions (vec­tion): E.g., does vec­tion allow us to per­form tasks we could not oth­er­wise per­form as well? We have first evi­dence that vec­tion can facil­i­tate per­spec­tive switches, and sev­eral exper­i­men­tal par­a­digms lined up to inves­ti­gate fur­ther behav­ioral mea­sures (Riecke, Feuereissen, Rieser, McNamara, 2015). As the iSpace lab works at the inter­sec­tion of Informatics, Psychology/Cognitive Science, Human Factors/HCI/Immersive Interaction Design, and Virtual Reality, you should bring a strong back­ground in at least one of these areas and be excited to expand into the other areas. PhD and MSc appli­ca­tions must also meet the reg­u­lar admis­sion cri­te­ria and will undergo the reg­u­lar admis­sions processes. Note that MSc appli­ca­tions will only be con­sid­ered if they show a strong inter­est in research, schol­arly dis­sem­i­na­tion, and poten­tially get­ting a PhD. Students: Funding is pro­vided through a com­bi­na­tion of teach­ing assist­ant­ships, schol­ar­ships, fel­low­ships and research assist­ant­ships. You will also receive full finan­cial sup­port when pre­sent­ing your research in suit­able schol­arly conferences. PostDocs: there are cur­rently no fully funded post­Doc posi­tions in the iSpace lab unfor­tu­nately, although I can pro­vide some interim fund­ing and am open to suit­able post­Docs that bring their own fund­ing (at least until we find addi­tional funds). I’d be happy to assist in apply­ing for exter­nal fund­ing. Funding is pro­vided at stan­dard Canadian (NSERC) rates includ­ing vaca­tion pay and ben­e­fits. Additional top-up is nego­tiable if you con­tribute sub­stan­tially to the writ­ing of research grants. If you are inter­ested in join­ing the iSpace team, please read on, then send me an email ( ) and include the fol­low­ing (else you likely won’t get a reply). unof­fi­cial tran­script, and any other information/documents/links you might find suitable. Please indi­cate how you might see your­self fit in (this is essen­tial — please under­stand that I won’t respond to generic or mass-emails. You don’t need to have a spe­cific research project in mind to apply, though, as long as you are open and excited about the kind of research we do). Please also indi­cate if you have any expe­ri­ence in pro­gram­ming in gen­eral, VR-specific pro­gram­ming, VR setups, 3D, and statistics/experimental design/data. I don’t require exper­tize in all these areas, but it’s useful to under­stand where your back­ground and strengths are and how you’d fit into the team. Feel free to add any other skills (aca­d­e­mic or non-academic) that I should be aware of. Positions are highly com­pet­i­tive, with appli­ca­tions due around Janurary/February for a September start. I’d be happy to arrange tele­phone or skype/google hang­out inter­views if there seems to be a good fit. Review of mate­ri­als is ongo­ing and will con­tinue until all posi­tions are filled. I look for­ward to receiv­ing your application! Prospective grad stu­dents: ALL grad­u­ate stu­dents at SIAT are rec­om­mended for admis­sion by the Graduate Admission Committee and then admit­ted by the Dean of Graduate Studies at SFU. Therefore you MUST sat­isfy all the require­ments set up by SIAT and SFU. Please check SIAT’s grad admis­sion pro­ce­dures and make sure to con­tact me before sub­mit­ting your appli­ca­tion. Off-cycle admis­sion is pos­si­ble for excel­lent candidates. Below is a sum­mary of my main research agenda so you can assess if and how you might best fit into our team. There’s also an out­line of some of the skills, expe­ri­ence, and char­ac­ter­is­tics that we value highly and will be useful for iSpace mem­bers. The appli­ca­tion process is com­pet­i­tive, and apart from your GPA the main admis­sion cri­te­ria are how well you’d fit into the iSpace team and can con­tribute to the over­all research agenda and vision (see below for details). I only super­vise MSc and PhD stu­dents with a strong research orientation. If you have already research ideas when apply­ing, great! If not, and you are just really excited about con­tribut­ing to our research agenda and vision (and are capa­ble in doing so), that also fine, and we should dis­cuss ideas before you write your “letter of intent” to make sure it will be a good mutual match. In either case, please check the iSpace research agenda and vision and our recent projects and pub­li­ca­tions to get a better idea of our research scope and approaches (although I’m always inter­ested in expand­ing into new excit­ing research areas). Below is a draft of some of the skills, expe­ri­ence, and char­ac­ter­is­tics that we value highly and will be useful for iSpace mem­bers. Of course, I don’t expect you to have mas­tery in all of these skills when join­ing the team — but you should be excited to expand in these areas. Note that all join­ing mem­bers should have at least some back­ground in pro­gram­ming and be eager to do research. Experience in pro­gram­ming, espe­cially in the con­text of VR or Computer graph­ics is quite valu­able. We cur­rently use Vizard from Worldviz, a python-based pro­gram­ming library for the real-time VR sim­u­la­tions, and are explor­ing the usage of the pop­u­lar game engine Unity3D which Bernhard also uses in his teach­ing of the immer­sive envi­ron­ments course IAT445. One of the tools we use for cre­at­ing nat­u­ral­is­tic 3D con­tent is the pro­ce­dural mod­el­ing mod­el­ing tool CityEngine. Publishing and pre­sent­ing research is not only the cur­rency in aca­d­e­mics, but also a way to give back to the com­mu­nity, both pro­fes­sional and gen­eral public. Thus, we highly value good schol­arly writ­ing, pre­sen­ta­tion, and gen­eral social/networking/communication skills. Working in an inter­dis­ci­pli­nary team can have it’s chal­lenges, but it is also incred­i­bly reward­ing, espe­cially for people with high proac­tiv­ity, enthu­si­asm & per­se­ver­ance, and good com­mu­ni­ca­tion and team/interpersonal skills. Technical skills in build­ing, con­struc­tion, main­te­nance, and other geeky and MacGyver-ly skill (from elec­tron­ics to set­ting up com­put­ers to build­ing phys­i­cal struc­tures in the lab) can also be valu­able (but aren’t a pre-requisite for being an iSpacer). Experience with VR equip­ment is cer­tainly a plus. We’re cur­rently using a custom-designed 2-axis cir­cu­lar tread­mill, sev­eral visu­al­iza­tion setups includ­ing sev­eral wide-FOV HMDs (HTC Vive, Oculus Rift, NVIS SX 111 with a pol­he­mus track­ing system), a large-screen pas­sive stereo pro­jec­tion setup, and a custom-designed high-resolution, large-FOV Wheatstone Stereoscope, and started inte­grat­ing var­i­ous sen­sors includ­ing the Leap motion con­troller as well as EEG sys­tems from Emotiv (EPOC & Insight) and Interaxon (Muse) inte­grated with a real-time 3D game engine (Unity3D) that we also use in our teach­ing. We’re cur­rently work­ing on improv­ing our real-time spa­tial­ized sound ren­der­ing (HRTF con­vo­lu­tion, and have the equip­ment for bin­au­ral record­ings. We’re also using a pimped Gyroxus gaming motion chair with addi­tional shaker for vibra­tion ren­der­ing, and are exper­i­ment­ing with other user-powered motion cueing inter­faces (aka “the ulti­mate gaming chair”). Check out our SIAT webiste or watch the or check out SIAT’s YouTube chan­nel. Below is an overview video (focused mainly on our under­grad edu­ca­tion, but still a good overview on that aspect of SIAT). 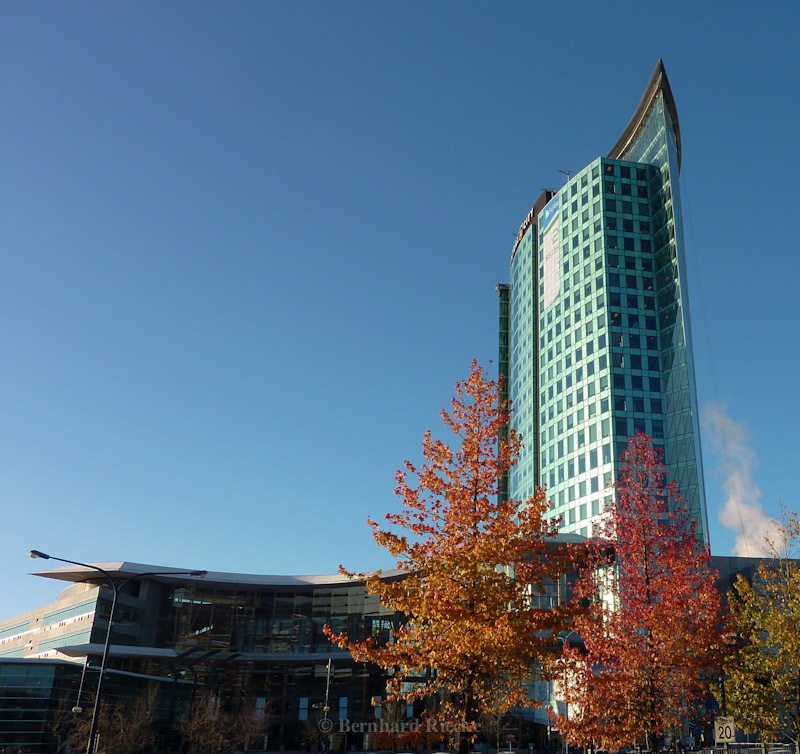 Directions by Skytrain: take the expo line direc­tion King George, exit at Surrey Central, walk across the park­ing lot to the tall office tower (with the SFU sign above the Blenz), take the wide stairs/escalator up to the Mezzanine (=2nd) floor. Take a right for my office (2759) which is in the SIAT cor­ri­dor, or walk up to the 3rd floor and take a right for the iSpace lab (room 3800). Note that the ele­va­tor won’t let you exit on the 2nd or 3rd floor.